PoreInfusion Acne Care products are specially formulated to treat and heal acne prone skin. Our highly effective ingredients will reduce inflammation, unclog pores, eliminate excess oil and heal post-inflammatory scarring. Every single product in our line is 100% acne safe. We carefully research and test all of our products to make sure they are non- comedogenic and safe to use on acne-prone skin. Before we introduce a new product in our line it has to go through a 3 -6 months in clinic testing period to eliminate any comedogenic factors. With so many ineffective products on the market, we want to make sure that our products will only benefit your skin. We are very passionate about animals therefore, we do not work with any lab or research center that uses animals for testing new products! All of our products are formulated in an FDA-registered production facility based in the United States. Our team of acne specialist and researchers are dedicated to staying on the forefront of the latest technology in the treatment of acne. Remember products alone will not solve your problem. 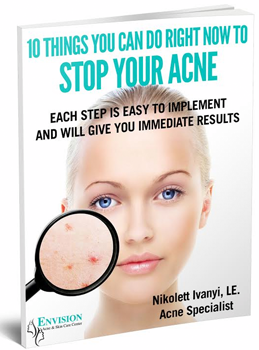 You need a help of an Acne Specialist! Some of our products contain very strong exfoliating ingredients and can cause irritation to the skin if it’s not used properly. If you are a new client and never used our products before we highly recommend to schedule an appointment for an in-office or virtual consultation so we can recommend products that are best suited for your skin.